Alright, this is my last pizza for a while, I promise. I didn't put pulled pork on this one either. 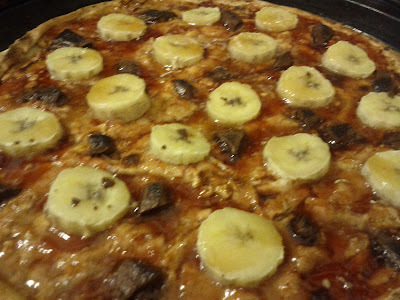 I smothered my last pita in a light layer of crunchy peanut butter, topped it with strawberry jam and a sliced banana. I added a bit of homemade scotch ale caramel to help the bananas caramelize and some swiss chocolate bits. Broil it until edges turn dark. It tasted exactly like it sounds. The bananas didn't caramelize. Next time, if there is a next time, I'll put a small amount of brown sugar on top of each banana instead of the caramel. This is easy food for a group of stoners, but it was too sweet for regular me last night.